The Australian mobile network operator has equipped sales staff in flagship stores with NFC lanyards, helping them to show customers what NFC can do, as well as adding NFC tags to advertising posters and to promotional materials available in shopping mall food courts. Australian mobile network operator Telstra has expanded its NFC marketing project, as it seeks to understand how best the technology can be used across its business. Working with Australia-based NFC specialist Tapit, Telstra is now testing three different uses for NFC tags in three different types of location. In this new phase, NFC tags are being used to enable customers with NFC phones to get a link directly to Telstra’s prepaid top-up page, making it easier to recharge their prepaid account while on the move; to obtain an app and access a free trial to pay TV service Foxtel, and to get a free trial to Telstra’s new MOG streaming music service. 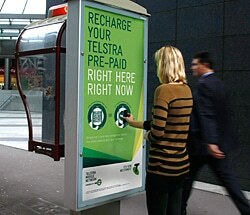 Telstra, Tapit and JCDecaux have added NFC tags to some twenty phone box advertisements in Sydney and Melbourne and NFC is also being used by Telstra store staff to promote NFC directly to customers and shoppers when they visit Telstra retail outlets. Staff at Telstra’s flagship stores in Sydney and Melbourne, as well as the Macquarie Centre and Chatswood stores in Sydney and the Chadstone and Doncaster outlets in Melbourne, have been issued with Tapit branded lanyards, enabling them to easily promote NFC functionality to shoppers. NFC-enabled promotional materials have also been distributed at the stores, along with window decals at some locations. Later this month, promotional materials containing NFC tags and QR codes will also be made available at food court tables in Sydney’s Warringah Mall and Macquarie shopping centres. “People can see for themselves, many for the first time, how easy and magical NFC is,” says Tapit.